Free Priority Delivery will be shipped in a blank, discrete envelope that will fit your mailbox. Therefore, you do not have to be at home to accept the envelope or sign for receipt. The envelope will appear to be a normal mail without any details about the product on it. We will guarantee total confidentiality about the product. Please use this method if you want a low-key delivery to you. Delivery usually takes 5-9 working days from date of posting, but may take longer if circumstances beyond our control disrupt postal services. Registered Mail Delivery will also be shipped in a blank, discrete envelope. The envelope is registered and buyer will be provided a tracking number upon confirmation of order. Registered Mail Delivery is different from Free Priority Delivery as the buyer has to be at home to sign for the envelope. Please use this method of delivery if you want to track your order. Fedex Shipping is the fastest way to you. Please be aware you need to be at the delivery address in order to accept the package or if you cannot be at the delivery location during the business day, you may sign a Fedex door tag authorizing release of the package without anyone present. The product will be sent in white, discrete envelope. Correct email address and phone number are required so that the tracking number can be sent to you. Orders from Asian countries will be delivered the next business day. Orders from UK and other European countries will take 2-3 business days only ! Free Shipping - Delivery usually takes 5-9 working days from date of posting, but may take longer if circumstances beyond our control disrupt postal services. 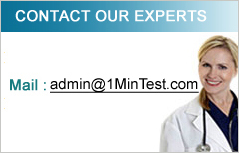 All sales come with 1 Min Test.com have 30-days warranty unless advertised differently. If the item(s) you have ordered is defective, contact us within the warranty period and we will replace the defective item(s) for you with an item of equal functionality. In the event that a suitable replacement is not available, a refund will be issued in the form of the original payment method.